THIS ONE IS A LITTLE DIFFERENT. ALL ABOUT THE SAME . The link above explains it in much better detail. Using that formula, I created a quick spreadsheet, just enter the Distance and Height, and it will calculate the putting distance based on the above formula. Also on tab 2 is a set of tables that can be printed, all that needs to be done is add/subtract elevation. THANK YOU BEREN . THIS WILL HELP PEOPLE A LOT . Just for an update, I still use this putting formula, and rarely 3 putt, and in the cases where I do, it is because of not reading the breaks right on a long put or missing the ding by too large a margin. It is not perfect, as in puts shorter than 10' usually need power added to the shot to keep it from being inches short. Same is true with long puts where you may need to reduce power, but after getting a feel for it, it should get you close. The champion greens may need more tweaking, but I use this when playing on them and it at least gets me close most of the time. 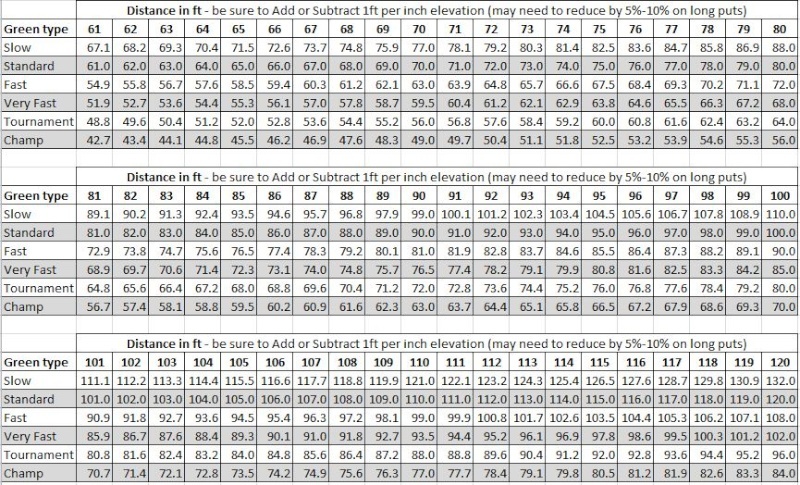 For those who do not have excel or a spreadsheet software that will not read it, let me know, and I will see if I can at least post the table in a .jpg format, then all that needs to be calculated is the adjustment for elevation (by adding/subtracting 1ft per inch). or view your xlsx Files . I'm sure others cannot as well . Thanks for the info. I will post the tables then in graphic format. Here are some pics. The first one is an example of using the spreadsheet of a 11ft put with 2in of elevation. For Very Fast it would result in a 11.4ft putting power. 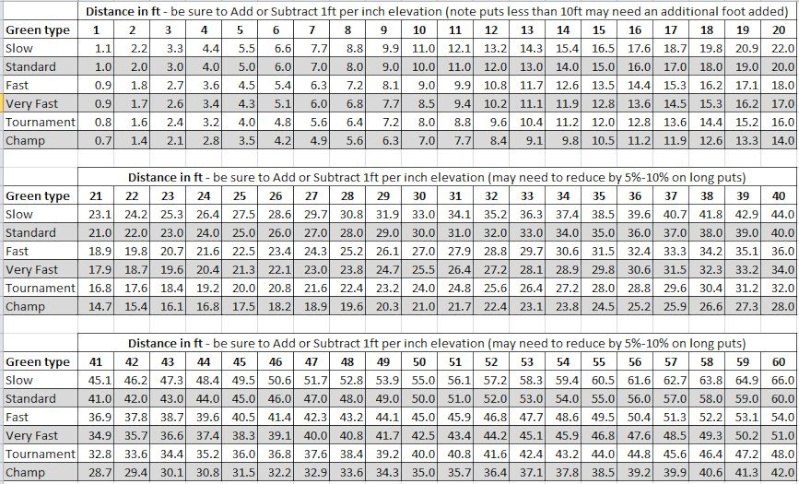 Table1 1-60Ft, Note that you will get the 11.4ft put in the example above if you take the 11ft for very fast green speed and then add 2ft for the 2 inches elevation. I find this formula to be just a little long . For your very fast greens Andrew try dividing the feet by 1.20 . And for tournament greens more like 1.35 . BTW Andrew you know you still have a match with Danwidget .